With all the posts I have written about the evils of replacing human workers with robots, my readers might think I’m a Luddite. Actually, I love technology when automation drives progress and growth. I appreciate technology when it opens up new markets and new jobs, when it makes life easier and helps us to stay young and healthy. I spent my career in high tech, after all, when innovation is constant. Whole new industries employed thousands of people doing things that had never been imagined before. 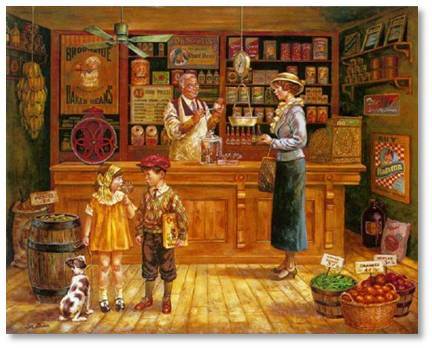 Food Shopping: Grocery stores used to be small shops with all the goods kept behind the counter. A customer would walk in and place her order with the owner who would, along with his clerk, pull the items from the shelves. Those employees would bag the groceries and tell the customer what she owed. Supermarkets changed this model by allowing us to walk the aisles, look at the goods, and make our own selections. That means we do the work of the clerk and that’s okay with me because I like choosing the best food. I resent being told to do my own scanning and bagging, however, and not because I’m afraid of using the automated checkout machines. A machine can scan but I have to bag and that means I’m working for the store for free—and without a discount. Jobs lost: Well, the clerks could have worked at the new big store and probably for more money than a small businessman could pay. Jobs gained: The supermarket could employ far more people. The small store owner might have lost his livelihood, though, if he wasn’t flexible enough to try something different. 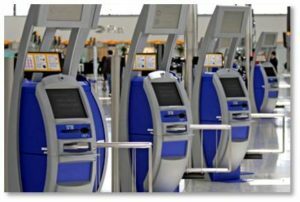 Airline Travel: I much prefer using the check-in kiosks to standing in long lines waiting for too-few agents to issue my boarding pass and check my bag. It took an adjustment but now I like it because the new way is faster and more efficient as long as the kiosk functions properly. The kiosk issues the boarding pass and then you move to a much shorter line to check your bag if you’re not carrying it on the plane. Jobs lost: all those counter agents. The lucky ones got to stay and monitor the kiosks or check-in bags. The rest suffered layoffs. Jobs gained: people in the companies that manufacture and maintain the kiosks. Travel Agents: If I just want to book a flight to a specific place and maybe a hotel room for overnight, I can use any one of the travel sites that let me do it far more quickly and easily than driving to a travel agent and sitting in an office while he or she manipulates an arcane system. If I’m booking a big, complex trip, however, then I want expert help from a human being who knows what he or she is doing. In that situation, online may be cheaper but it’s certainly not easier. When we planned our Viking River Cruise to France last year we went to the AAA office near us and met with an experienced travel agent. After listening to what we wanted, she got on the phone with her contacts. In an hour the entire trip was booked, including our flights (free), onboard discount and trip discount. Also the separate excursions we wanted to take (truffles, oysters, wine) and our trip insurance. Done in 60 minutes with no stress over what was best and cheapest or whether we had gotten a good deal. Jobs lost: a lot of independent travel agents. Sites like Orbitz, Travelocity, and Cheapo Air put a lot of travel agencies out of business but there’s still a demand for experienced help. Jobs gained: the people who work at the travel software companies and for organizations like AAA. We can’t stop progress, nor do we want to. New innovations and improvements will inevitably put some people out of work. Few people now make a living manufacturing buggy whips, horse-drawn carriages, iron lungs, corsets and chamber pots. The problem arises when so many jobs are offshored and automated that not enough people are left with the means to buy the products. 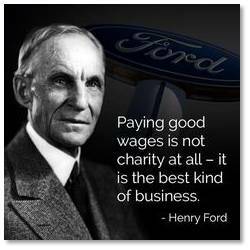 Henry Ford understood that when he decided to pay his workers enough to purchase the cars they manufactured. Franklin Delano Roosevelt understood that when he argued the need for businesses to pay their workers a living wage. The law of supply and demand can’t be cut in half because there’s no profit in just producing a supply. You would think the businessmen would grasp this. After all, they pride themselves on their intelligence and get paid millions for their foresight, decisiveness and grasp of the market. Granted, they have no fiduciary responsibility to the United States economy in general or to the welfare of the country’s population. They only owe responsibility to the profitability of the company they manage. Still, that includes growing your customer base, not shrinking it. And, really, the bottom line so simple: Robots buy nothing.